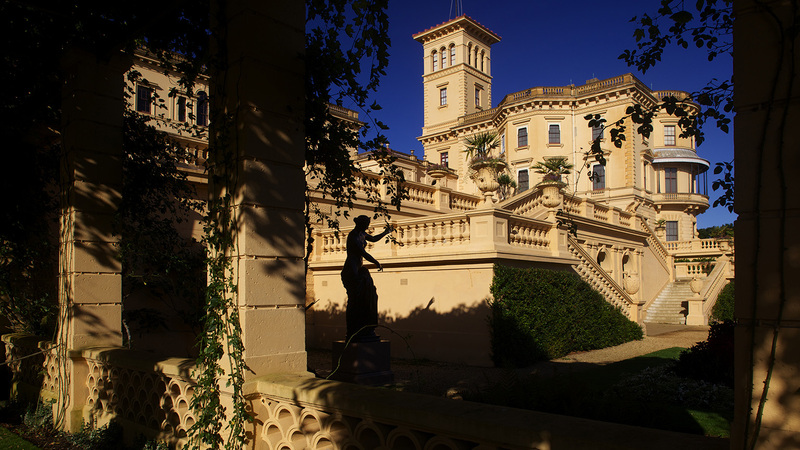 Queen Victoria built her beloved villa on the Isle of Wight as a seaside retreat from the pressures of court duties, and it offers an intimate glimpse into her family life and personal taste. Thomas Cubitt, who built the façade of Buckingham Palace, was charged with creating the holiday home in 1845. Working closely with Prince Albert, he produced something approximating to an Italian Renaissance palazzo, set in splendid formal gardens overlooking the Solent. Inside is a mixture of the opulent and homely. On the ground floor of the central pavilion are the formal rooms, complete with impressive ceilings and plenty of false marble, where the Queen would occasionally receive state visitors. These rooms contain reminders of the family's links with other crowned heads of Europe. In the Billiard Room, for example, there's a porcelain vase that was a gift from the Russian Tsar. The Grand Corridor acts as a formal sculpture gallery. The Queen and her husband would parade here in bad weather, enjoying their collection of statues. The decorative highlight is the Durbar Room, designed by Lockwood Kipling (Rudyard Kipling's father). It was added in 1890–1 and celebrates Victoria's role as Empress of India. A fabulous stucco peacock presides over the fireplace, the walls are decorated with Indian symbols and the floor is covered with a carpet from Agra. The presents that Victoria received on her Golden and Diamond Jubilees are on display here. Upstairs, the private rooms, bedrooms and nursery have a more domestic flavour. The children's bedrooms are close to those of their parents, which was unusual in grand houses at this time, showing how Victoria and Albert wished to create a natural and intimate atmosphere for their nine children. Queen Victoria died at Osborne in 1901, but her children did not share her enthusiasm for the place, and it was given to the nation by Edward VII. Over the past decade, English Heritage has carefully restored it to how it appeared during the Queen's lifetime. The Queen placed Winterhalter's La Siesta in her dressing room, so she could see it every day during her visits to the house. An unashamedly sensual work, it shows three young women sheltering from the midday Mediterranean sun. The Durbar Room contains four dining chairs built to the specification of Bhai Ram Singh, Kipling's assistant. Their free carving reflects the best Indian craft tradition.